101 Montgomery is a skyscraper in San Francisco, California. The building rises 404 feet (123 meters) in the northern region of San Francisco’s Financial District. 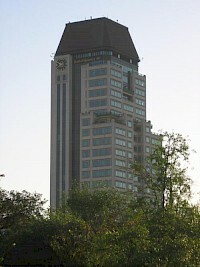 It contains 28 floors, and was completed in 1984. 101 Montgomery is currently tied with Embarcadero West as the 39th-tallest building in the city. 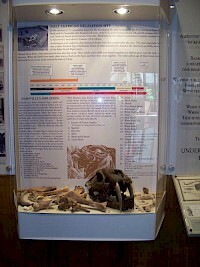 The building's developer was Cahill Contractors. The building has earlier served as the headquarters of Charles Schwab & Company. 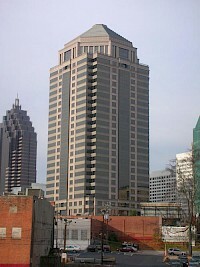 1100 Peachtree Street is one of the prominent buildings of Midtown Atlanta, Georgia. The 28-story, 618,000 sq ft (57,414 m) building is currently owned by Atlanta-based property management company Carter Associates and the San Antonio-based USAA Real Estate Co. It was previously partly owned and largely occupied by telecommunications company AT&T providing offices for its top executives. Besides BellSouth, the other major occupant is law firm Kilpatrick Stockton, LLP. 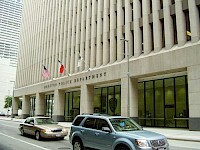 1200 Travis is a 28-story building in Downtown Houston, Texas that is currently occupied by the Houston Police Department as its current headquarters. At one time it was known as the Houston Natural Gas Building. The building, with 575,000 square feet (53,400 m) of rentable space, has a typical floor size of 16,500 square feet (1,530 m). 300 North Meridian is a high rise in Indianapolis, Indiana. It was completed in 1989 and is currently the fifth-tallest building in the city. It is primarily used for office space. 461 Fifth Avenue at 40th street is a 28-story skyscraper located in the Grand Central Terminal area of the Midtown Manhattan section of New York City. 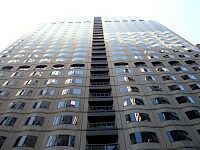 The building was constructed in 1988 by the Mitsui Fudosan development group and designed by Skidmore, Owings & Merrill. In the late nineteenth century, 461 Fifth Avenue was the residence of the Misses Furniss, who were known for hosting musicals and other social functions. They had acquired the address from a J. M. Bixby sometime after 1873. 621 17th Street, formerly known as the First Interstate Tower South, is a high-rise building in Denver, Colorado, United States. 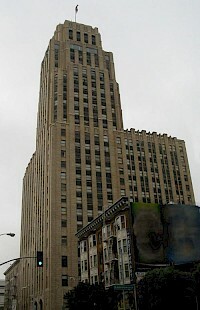 The building was completed in 1957, and rises 28 floors and 385 feet (117 m) in height. 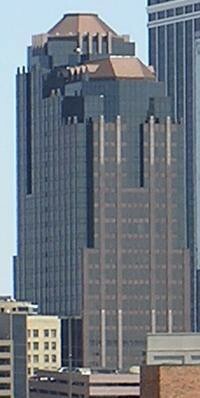 The building stands as the 20th-tallest building in Denver and Colorado. It also stood as the tallest building in the city at the time of its 1957 completion, and held that distinction for eleven years until it was surpassed by the 420-foot (128 m) Brooks Towers in 1968.